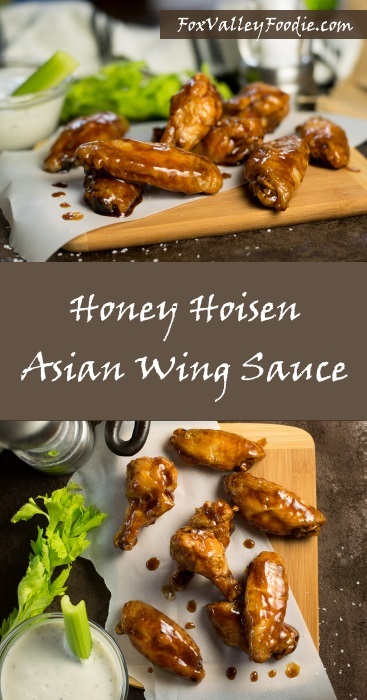 My Honey Hoisin Asian Wing Sauce is the perfect way to add a sweet and sticky Asian flare to crispy chicken wings at your next party! Have you ever had a really good idea that just didn’t work out? That was me today. I thought I had a great recipe idea that was going to revolutionize the world. Short order cooks were going to gather in my kitchen and hoist me up upon their shoulders chanting “Fox Valley Foodie! Fox Valley Foodie!” I would get a little embarrassed by the hoopla, but, still, I would gracefully let them indulge in the fanfare. OK, maybe I didn’t think the recipe was that ‘great’, but I still thought it was going to be worth serving your family. Instead, it stunk. It wasn’t even worth salvaging. So I licked my wounds and quickly cleaned the kitchen to wipe away any evidence that I even tried in the first place. 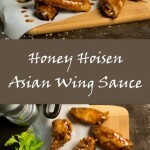 Luckily I have this Honey Hoisin Asian Wing Sauce recipe waiting in the ‘wings’. Get it!? I made a pun. The honey makes the sauce sweet and sticky while hoisin and soy gives it a deeper flavor, accented by bright notes of ginger. This is a perfect recipe to compliment the mind-blowing How to Make Crispy Baked Chicken Wings recipe I posted a few months back. Seriously, it is the best oven baked chicken wing recipe I have ever found. You need to try it. 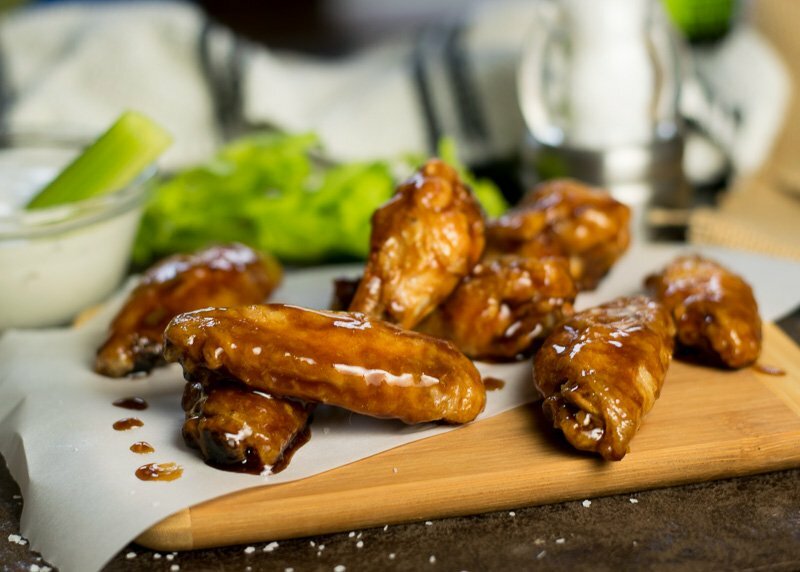 You can use my Honey Hoisin Asian Wing Sauce on the wings after you bake them in the oven. When baking chicken wings, I highly recommend using an oven safe cooling rack on a baking sheet. This elevates the wings to allow better airflow and more even baking. 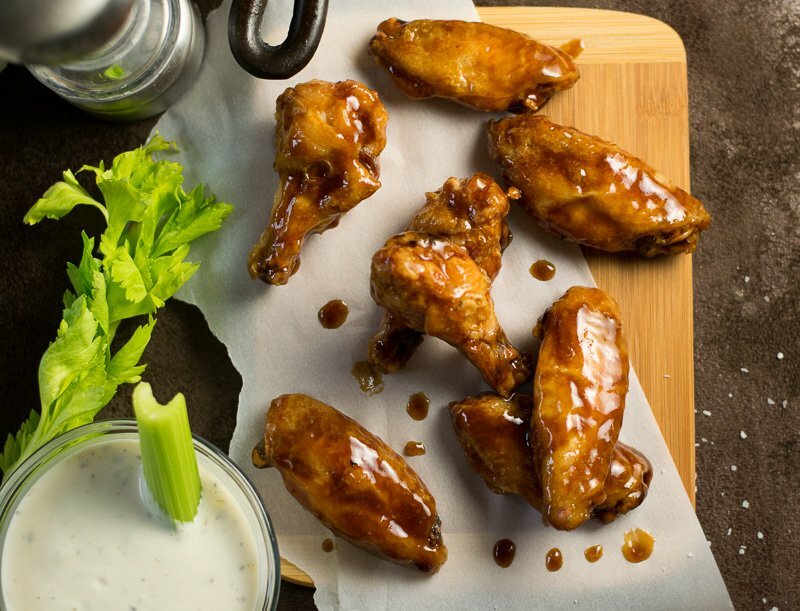 If you bake the wings directly on the pan, the portion touching the pan will cook considerably faster than the top of the wing. The honey makes the sauce sweet and sticky while hoisin and soy gives it a deeper flavor, accented by bright notes of ginger. Melt butter and combine with all remaining ingredients. If you enjoyed reading my Honey Hoisin Asian Wing Sauce recipe then you should probably like me on Facebook and follow me on Pinterest too. That’s what I would do at least, because if you don’t get to know me but you still use my recipe it is kind of like taking candy from a stranger, and your mom taught you not to do that. Don’t disobey your mom, subscribe to Fox Valley Foodie today. Tried the sauce recipe out and just wanted to let you know it’s certainly good (a little on the sweet side for me, but nothing that can’t be edged back a bit for my personal tastes!) Thanks for sharing!